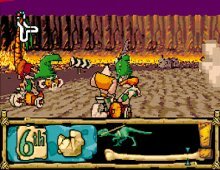 A fun prehistoric racing game that was also released on many console systems, e.g. 3DO and Megadrive. The storyline is as simple as the gameplay: millionaire caveman Millstone Rockafella has arranged a formula BC contest with a Ultimate Boulderdash Bike as the prize. A host of bizarre characters have entered in pairs -- one driving, one deploying weapons from the side-car -- in a wacky race across eight circuits ranging from a 'jungle rumble' to the hellish 'volcano dash'.